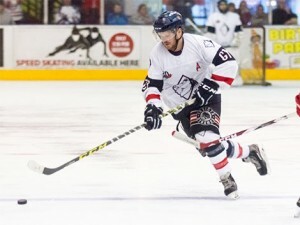 The Invicta Dynamos are delighted to announce that 30 year old defenceman Arran Strawson will be returning to the club for a sixth straight season looking to add to the 252 games played and 209 points he has already amassed in Gillingham. Arran Strawson’s relationship with the Dynamos dates back to the summer of 2012 when Head Coach Kevin Parrish tempted him to Kent from the Wightlink Raiders. Since then the Sheffield born skater has been ever present at the SilverBlades Gillingham in the NIHL South’s top tier lifting the NIHL Southern Cup in 2014/15 and claiming the NIHL Southern Playoff title last season in 2016/17. In his time with the Mos, Strawson has predominantly iced in defence yet still managed a remarkable 49 goals and 160 assists for a total of 209 points in 252 outings making him the 15th highest points’ scorer in the club’s 20 year history. 38 of those points came last term as the team’s number 61 found twine 9 times and played a role in a further 29 goals to finish the campaign as the side’s highest point scoring defenceman. From September the blue liner will be looking to continue his excellent form with the Dynamos as they line up in what is now British ice hockey’s second tier for 2017/18. Speaking on the re-signing of Arran Strawson, Head Coach Kevin Parrish said, “Anyone who has watched the Dynamos for any amount of time will know that Arran is a big part of the club both on and off the ice. He is by far one of the more experienced players in our line-up and he has more appearances for the Mos than any other player currently on our roster. As a result he has a fantastic relationship with the supporters and is passionate about the team. On the ice Arran is a hard hitting defenceman with a powerful shot, an eye for an assist and will always step in to defend his teammates. Off the ice he is a character in the changing room and a strong voice that encourages his teammates. It is for these reasons that Arran will once again wear the ‘A’ of alternate captain”. 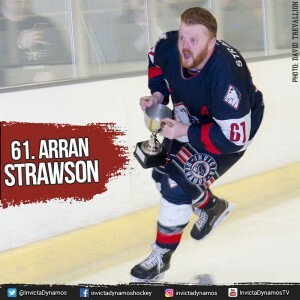 Arran Strawson will continue to wear the number 61 jersey he has made his own and is the fifth defenceman to make the roster for 2017/18 following the return of Ondrej Zosiak, Tommy Ralph and Harrison Lillis and the capture of Ryan Morgan. News of further additions to the roster will be revealed in the coming days. Warm-up Jersey – For just £125 get your name or logo printed on the back of Arran Strawson’s warm-up jersey. Sponsors are also named on our website and in our match day programme and then presented with the jersey to keep at the end of the season. Game jerseys – For just £150 get your name or logo printed on the back of Arran Strawson’s home or away game jersey. Want both? For just £250 for individuals / £300 for businesses get your name or logo on the back of each of Arran Strawson’s game jerseys. Sponsors are also named on our website and in our match day programme, are announced over the loudspeaker during player introductions at every home game, receive a programme advert (business sponsors only) and are presented with their jersey (one shirt) at the end of the season.